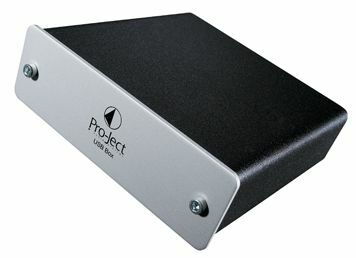 Pro-Ject USB Box review | What Hi-Fi? If weight was the only measure of quality, this Pro-ject would romp home with five stars: this tiny unit feels like a brick. But it’s sound that matters to us, and it’s here that the USB Box is lacking. Connect your computer to the USB (the single input) and the Pro-ject will draw power and convert 16-bit, 44.1kHz tracks before outputting them through the stereo RCA outputs. Play Nick Cave’s soundtrack to The Road and the USB Box digs up plenty of detail and precision, and has a tonal transparency that means instruments have a convincing timbre, which is a rarer quality than it sounds. The problem is that notes don’t link with each other as well as they might, resulting in a slight lack of cohesiveness. This combines with a surprising lack of dynamics to create a delivery that’s a little pedestrian – and that’s a shame, because with more drama and bite sitting alongside that tonal sweetness, it could’ve been great.